If you are a web development company specialized in WordPress development and you are looking to expand your business, here is an idea how you can almost automate the influx of quality leads. As with any idea, this will work very well in the beginning until saturation in the market, as nobody seems to be doing it currently. 1. 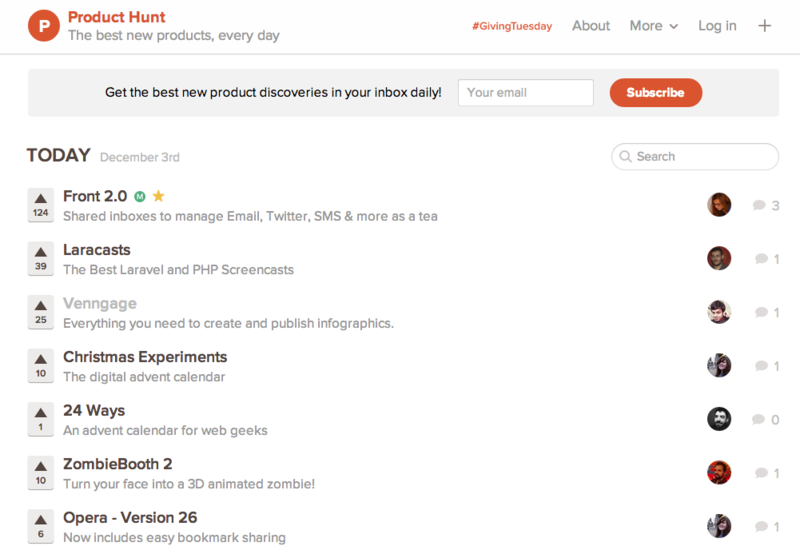 Subscribe to updates from sites that promote newest startups. Since WordPress is the most widely spread web publishing platform on the Earth, chance is that some, if not most of them, will need to interact with WordPress platform at some point. This is where you jump in. 2. Check out if their service needs some kind of WordPress integration. With time you will develop an instant ‘feeling’ for it. By integration I mean for example if it was Digg they would need a Digg button for WordPress. Then find their contact and get in touch, offering to develop their WordPress integration. Going to ProductHunt just now, I found about Venngage – service to help create beautiful infographics and publish them online. Bingo! Seems like a service that would benefit from having a WordPress plugin. This should not be too hard to do for them, but you will have something they don’t – expertise and time for developing in WordPress. If you are really good, you will also have recognition in the WordPress community which you can leverage in your pitch as a way for their startup to gain more traction and users. Although this might be seen as cold calling at first, it does not need to be if you present the case seriously and there is obvious advantage of having a WordPress plugin for their service. There are literally hundreds of startups launched every day so with this strategy you should be able to produce a healthy stream of deals. 3. Once you get going there are all sorts of things you can be doing. For example you can up-sell them a corporate/news blog. They will need to have one at certain point, and you will be ideal to make it for them as you already have understanding of their brand and service. Beauty is that startups usually need these kinds of things badly but never have enough time or resources to devote to it – which can make you or your company an ideal pick. A very novel idea. However, this means that the startups have to be currently using WordPress on their sites, correct? Or did I not understand something clearly? No, they do not need to be using WordPress. But they still might need WordPress plugin/integration for their service.